Brendan McInerney (front, from left), Noah Piou, Emmett Dalton and their fellow students from Roxbury Latin boys' school carry the casket of a man who was left unclaimed by family to a grave site in Fairview Cemetery on Friday. 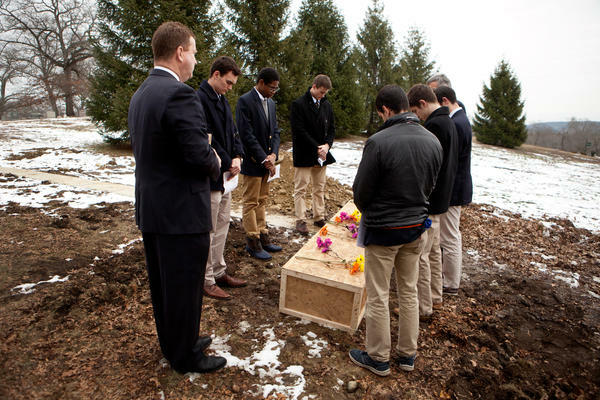 From left to right, funeral director Rob Lawler; Roxbury Latin students Emmett Dalton, Noah Piou and Chris Rota; Roxbury Latin assistant headmaster Mike Pojman, and Roxbury Latin students Brendan McInerney, Liam McDonough and Esteban Enrique conduct a graveside prayer service for Nicholas Miller on Friday at the Fairview Cemetery. Roxbury Latin seniors Chris Rota, Liam McDonough, Emmett Dalton, Esteban Enrique, Brendan McInerney and Noah Piou, and assistant headmaster Mike Pojman, listen as funeral director Bob Lawler explains the circumstances of the death of Nicholas Mlller, whose body was unclaimed, at the Robert J. Lawler & Crosby Funeral Home. 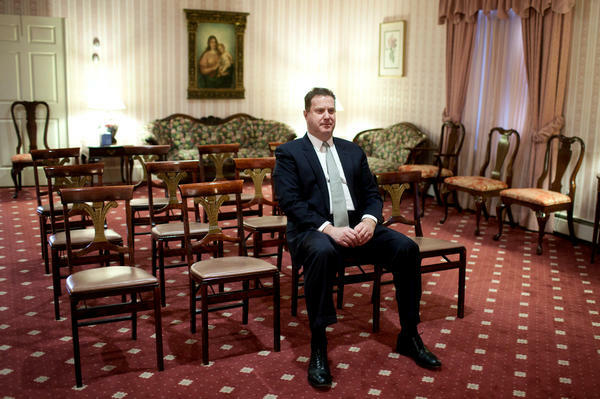 Funeral director Bob Lawler sits alone in a visitation room with the casket of Nicholas Miller as he waits for students from Roxbury Latin school to arrive and act as pallbearers for the burial. Funeral director Bob Lawler walks back into the Robert J. Lawler & Crosby Funeral Home after the burial at the Fairview Cemetery on Friday. On the drive to Fairview Cemetery in the Boston neighborhood of Hyde Park, six seniors from Roxbury Latin boys' school sit in silent reflection. Mike Pojman, the school's assistant headmaster and senior adviser, says the trip is a massive contrast to the rest of their school day, and to their lives as a whole right now. Today the teens have volunteered to be pallbearers for a man who died alone in September, and for whom no next of kin was found. He's being buried in a grave with no tombstone, in a city cemetery. "To reflect on the fact that there are people, like this gentleman, who probably knew hundreds or thousands of people through his life, and at the end of it there's nobody there — I think that gets to all of them," Pojman says. "Some have said, 'I just gotta make sure that never happens to me.' "
"Dear Lord, thank you for opening our hearts and minds to this corporal work of mercy. We are here to bear witness to the life and passing of Nicholas Miller. "He died alone with no family to comfort him. "We are honored to stand together before him now, to commemorate his life, and to remember him in death, as we commend his soul to his eternal rest." Each of the young men in turn read a poem, verse of scripture, or passage about death. Emmett Dalton, 18, reads "A Reflection On An Autumn Day," which ends "death can take away what we have, but it cannot rob us of who we are." After the ceremony, the seniors share their thoughts about an experience— in the middle of a school day — that has hit them hard. "I know I'm going back, and I'm going to go to school and take another quiz," says 18-year-old Brendan McInerney, "but all that work, you can get caught up in it. ... When you kind of get out of that bubble that you can kind of stuck in, you get perspective on what's really important in life." Mike Pojman was inspired to start bringing students to these funerals by a similar program at his alma mater, St. Ignatius High School in Cleveland. 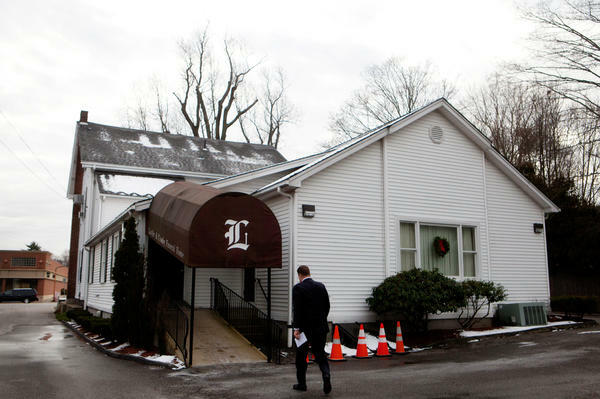 He turned to local funeral home Lawler and Crosby — which, by coincidence, is one of the very few funeral homes in the state that steps in to help with these kind of burials. "It's the right thing to do," says funeral director Robert Lawler. "You know, you can't leave these poor people lying there forever." When there are no family members or volunteers available, it's just Lawler by himself, saying a prayer at graveside. After doing this for 42 years, he appreciates the effect it has on people like 17-year-old Roxbury Latin senior Noah Piou. Today's ceremony for Nicholas Miller was the first funeral he's attended. "That's my first real moment presented with some form of death before me, and I was kind of at a loss for words at the time," he says. "I've never met Mr. Miller before, but even within that I kind of had a connection with him, and I could feel that." After the brief ceremony the students laid flowers. Then they piled back into the van, driving back to school in time for their next lesson. Six teenage boys recently volunteered to be pallbearers for a man they did not know. This happened outside of Boston. And there is a story behind their decision, NPR's Arun Rath found as he watched them work. ARUN RATH, BYLINE: On the drive to Fairview Cemetery in the Boston neighborhood of Hyde Park, the boys sit in silent reflection. Mike Pojman, the school's assistant headmaster and senior adviser, says it's a massive contrast to the rest of their school day and their lives right now. MICHAEL POJMAN: To reflect on the fact that there are people like this gentleman, who probably knew hundreds or thousands of people through his life and at the end of it, there's nobody there, I think that gets to all of them. And some have said, I'm just going to make sure that never happens to me. UNIDENTIFIED MAN #1: Gentlemen, I'm going to have three on either side. RATH: The students, dressed in jackets and ties, are pallbearers for the plane wooden coffin and take part in a short memorial. UNIDENTIFIED GROUP: Dear Lord, thank you for opening our hearts and minds to this corporal work of mercy. We are here to bear witness to the life and passing of Nicholas Miller. RATH: Nicholas Miller died back in September. But officials could find no one to claim his body. So he's being buried this day in a grave with no tombstone in a city cemetery. UNIDENTIFIED GROUP: He died alone, with no family to comfort him. But today, we are his family. We are here as his sons. We are honored to stand together before him now to commemorate his life and to remember him in death as we commend his soul his eternal rest. (Speaking Latin). RATH: Each of the young men in turn read a poem, verse of Scripture or passage about death. Emmett Dalton read, "A Reflection On An Autumn Day." EMMETT DALTON: (Reading) Death can take away from us what we have. But it cannot rob us of who we are. RATH: After the ceremony, the seniors share their thoughts about an experience that hit them hard in the middle of a school day. BRENDAN MCINERNEY: I know I'm going back. And I'm going to go to school and take another quiz. But all that work, you can get caught up in it. RATH: That's 18-year-old Brendan McInerney. He says as solemn as it was, the break to ponder the big questions of life and pay something back is a gift. MCINERNEY: You get out of that bubble that you're - that you can kind of get stuck in. And you get perspective on what's really important in life. RATH: Mike Pojman was inspired to start bringing students to these funerals by a similar program at his alma mater, Saint Ignatius High School in Cleveland. He turned to the local funeral home, Lawler and Crosby, which by coincidence is one of the very few funeral homes in the state that steps up to help with these kind of burials. Robert Lawler is the director. ROBERT LAWLER: It's the right thing to do. You know, you can't leave these poor people lying there forever. RATH: When there are no family members or volunteers available, it's just Lawler by himself, saying a prayer at graveside. After doing this for 42 years, he appreciates the effect it has on people like 17-year-old Noah Piou. Today's ceremony for Nicholas Miller was his first funeral. NOAH PIOU: It was my first real moment presented with some form of death for me. And I was kind of at a loss for words at the time. I've never met Mr. Miller before, but even within that, there's - I kind of had a connection with him. And I could feel that. RATH: After the brief ceremony, the students laid flowers and piled back into the van. They had to get back to the school in time for their next lesson. Arun Rath, NPR News, Boston. Transcript provided by NPR, Copyright NPR.